The Kissed Mouth: It’s not Huguenot but what you know…. I saw La Reine Margot recently for the first time (I know, I know, it was on my ‘to do’ list) and was completely blown away by the astonishing beauty of it. I did have a feeling before watching that it would be advisable not to get attached to anyone, and that proved to be a sound policy, as things do not go smoothly for the utterly-dazzling Margot and her equally pretty lover, or in fact anyone. My favourite moment has to be the poisoned book. I may never lick my fingers to turn a page again. 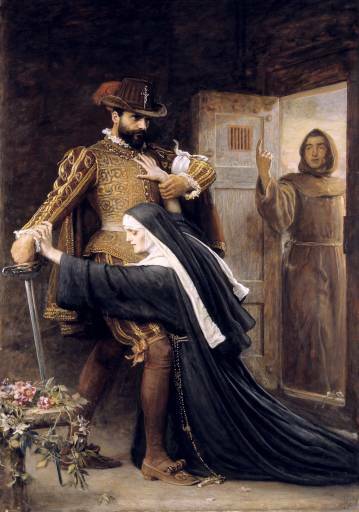 A kneeling nun pleads with a splendidly dressed gentleman, while a monk beckons from the doorway. 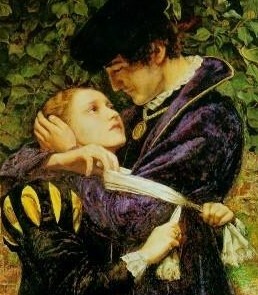 She is trying to restrain his murdering fervour, but the man fixes his eyes beyond her and prepares to cast her aside. There is a delicious irony in the fact that although he has a big crucifix on his hat to prove how extra-Holy he is, he is thoughtlessly about to trample the nun’s rosary beneath his foot in his eagerness to start with all the killing. I find the figure of the monk a little odd, he looks like he has wandered in from another canvas and his raised finger is ripe for a bit of naughty captioning. 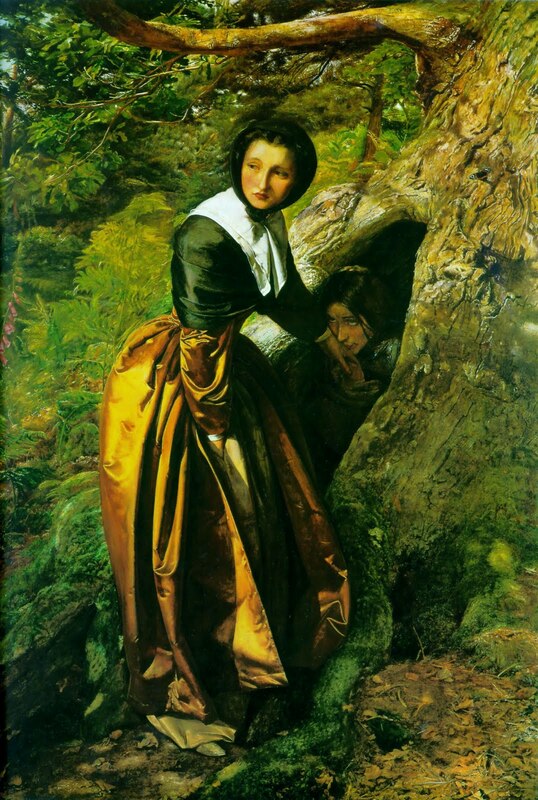 I am disposed to think that maybe Millais intended him to be an incongruous Christ, asking for devout followers to follow him, but this religious fellow is bent on anything but love and brotherhood. 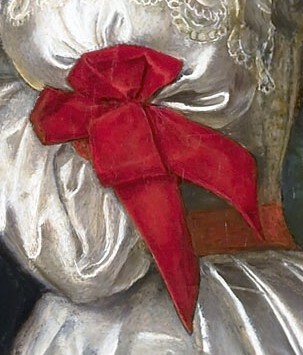 In the foreground, passion flowers and roses appear to be damaged and discarded, hinting at the ignorance and crushing of religion and love due to murder and self-interest. Whatever the motives for the gentleman to kill the Huguenots, you can bet they aren’t entirely honest. He looks like he’s expecting a marvellous time, unlike the couple in Millais’ other work on the subject. Meanwhile, in another part of Paris, a Catholic girl embraces her Huguenot lover and tries to tie a white band to his arm to ensure his safety in the upcoming slaughter. 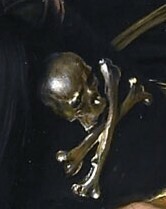 The Huguenot holds his beloved, but gently draws the band from his arm. Compared to the violence of gesture in the previous picture, their moment of anguish is quiet, but no less dramatic. Without the protection he will die, but he will not deny his faith in order to escape. This couple get flowers too; the Canterbury Bells tell of constancy and faith, the ivy echoing this sentiment and also the theme of friendship in adversity. Maybe our couple will survive, his faith seeing him through the trouble. However, the nasturtiums are a token of sorrow, so he is well and truly done for. 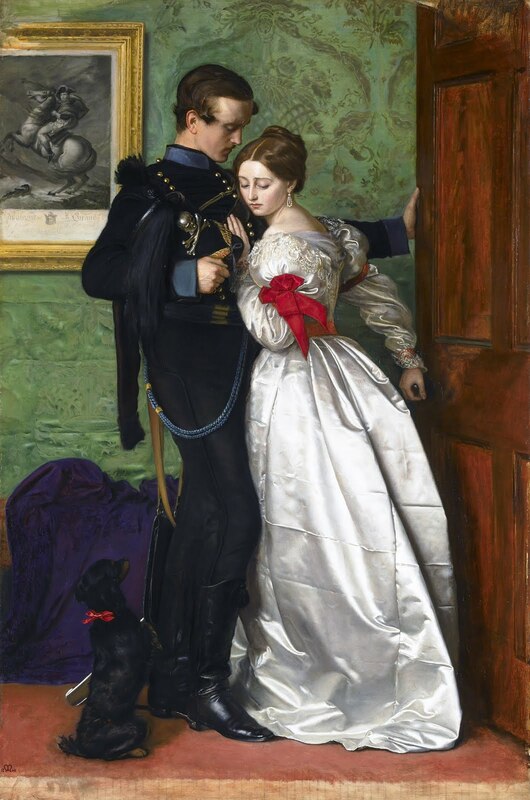 I think there is no doubt that our Black Brunswicker is for it, as the big blood red bows on her sleeves and on the dog hint at his blood about to be shed. Oh, and he has a massive scull on his hat. That'll do it. Out of the three, The Black Brunswicker and The Huguenot have the most in common in terms of theme and composition. The women are offering a way out of almost certain death to the men they love, but the men are choosing to go and meet their fate because of loyalty to the things they hold closest to their hearts, their faith and their duty. 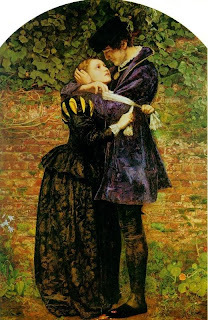 It is perhaps noteworthy that the men of Millais' pictures shown here all hold things other than 'love' highest in their values. Although the Nun who pleads with the man in Mercy is not his lover, she is asking him to value love for his fellow man above duty to religion and state. He will not. The Huguenot would rather die a Protestant than be with his lover, and likewise the Soldier will open that door and die rather than let his lady detain him. I am left with the question, if the roles were reversed would the Victorian heroines make the same choice? Not much changes really. I suspect that on the whole women are more sensible. Do you think Gustav Klimt's 'The Kiss' might have had a bit of inspiration from 'A Huguenot on St Bartholomew's Day' I sometimes wonder - Klimt would perhaps have known of it. Nasturtiums also can mean 'patriotism' by the way, so that would be appropriate symbolism, too. It is, when all is said and done, a fabulous painting. Thank you for your excellent post. Interesting point, Mr Parry, I agree that the positions and emotions are similar. Despite changing his style of works in later life, I think that Millais cannot be rivalled in his ability to capture an emotion in the position of his figures and their very subtle facial expressions. I saw the Millais at the Tate and I was even blown away by things like Cherry Ripe, which is pretty much appalling. He is a complicated man indeed.